Martha Stephens McMillan Wittmann, age 87 of Laurinburg passed away to her Heavenly home, Tuesday, April 9, 2019. Martha was born March 10, 1932 in Robeson County, a daughter of the late John Pope Stephens and Rosa Johnson Stephens. She was the loving wife to the late Charles Paisley McMillan and a dedicated homemaker who raised five children. She enjoyed volunteering with Meals on Wheels and served as a volunteer at Cape Fear Valley Hospital. She worked with the Board of Elections as needed. She loved camping with her family at the Ponderosa Camp Ground in Myrtle Beach, SC. She enjoyed bird watching and flowers, occasionally helping a friend in her florist shop. 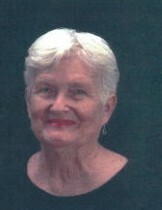 Martha enjoyed interacting with others and was always willing to help those in need. To her family she will be remembered as a loving wife, mother, grandmother, sister, aunt and friend. Martha is survived by husband, Harold William Wittmann and her children, Stephen McMillan (Phyllis) of Laurinburg, Roseanne McNeill (Allen) of Red Springs, Janie Blank of Wilmington, Jody Jernigan (Stacy) of Fayetteville, Richard McMillan (Kim) of Red Springs; twelve grandchildren, Christy McMillan, Christopher McMillan, Terri McNeill, Katie Runner (Rob), Wendy Obeda (Larry), Jo Anne Parker (Rob), Maria Canas, Shelley Cosby (Malcolm), Marisa McMillan, Karina McMillan, Ryan McMillan, Zina McMillan; eleven great grandchildren, Josie Pfistrner, Colten Pfistrner, Sydney McMillan, Addison McMillan, Kameron Obeda, Bennett Parker, Peyton Parker, Antonio Cabral, Mateo Cabral, Sophia Cabral, and Paisley Canas. A memorial service will be conducted at Noon, Saturday, April 13, 2019 at Trinity United Methodist Church in Red Springs. The family will receive friends prior to the service on Saturday from 11:30 a.m. until Noon at the church. A private interment will be held at a later date. The family requests in lieu of flowers for memorials to be made to the Trinity United Methodist Church, P.O. Box 48, Red Springs, NC 28377.